I have a complicated relationship with wings. They tend to betray me when I eat them in public. Shortly after I started my first real job, a partner knocked on my door to invite me out to lunch. I had just gotten back from this place across the street and was digging into a styrofoam container of particularly good bbq wings when he opened the door. Now when I say “digging into,” I don’t mean some kind of very appropriate, lady-like nibble, I mean shoes-kicked-off, sauce-at-the-side-of-my-lips, GETTIN-MY-GRUB-ON type of “digging in.” I was mortified. I wanted the ground to open up and swallow me. And yet, I could not put the wings down. I just sort of stared at him. And then back down at the wings. And then back up at him. “It’s fine,” he said quietly as he closed the door. “I can see you are busy.” D’oh! 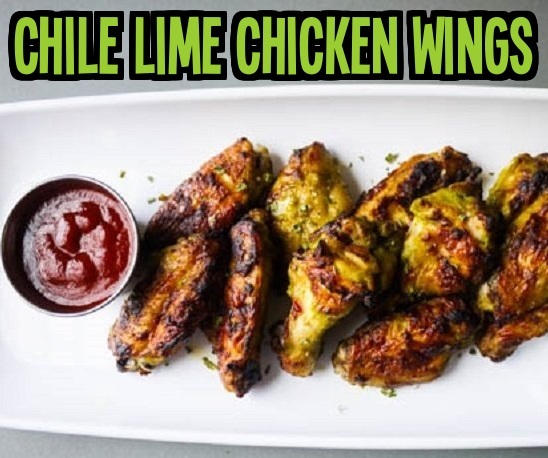 This is very minimally adapted from Nom Nom Paleo’s Chile Lime Chicken Wings and you will surely want to eat these in total privacy because Jesus Christ himself could knock on your door and you STILL would not be able to put these wings down. The first time I made these, we just stood at the stove eating. They did not even make it out of the kitchen. These wings are just soooo good! 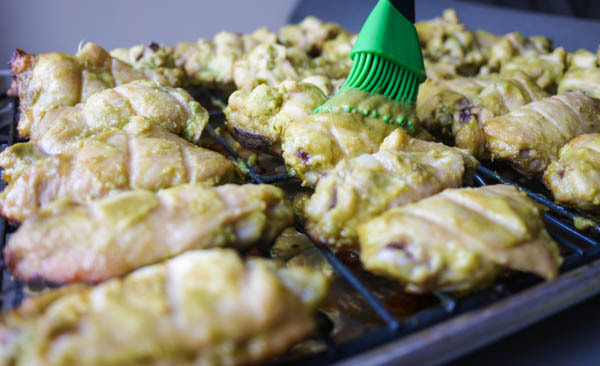 Michelle of Nom Nom Paleo makes hers on the grill and uses soy substitutes to make the recipe paleo-compliant, but my version is made in the oven and uses traditional soy-based ingredients. Put 3 pounds of wings in a big ziploc bag. 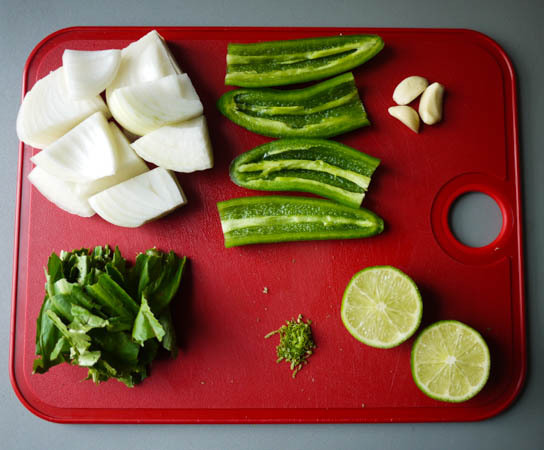 Coarsely chop half an onion, de-seed 2 jalapeno peppers, pull out 3 cloves of garlic, zest and juice 2 limes, and break 1/2 a bunch of cilantro into smaller pieces. 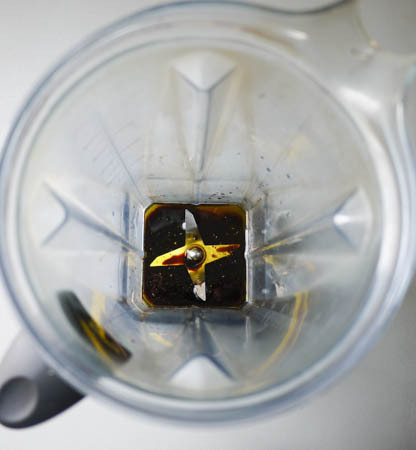 Combine salt and pepper, fish sauce, soy sauce and oil in a blender. Toss in your onion, jalapeno, garlic, lime zest and juice, and cilantro. 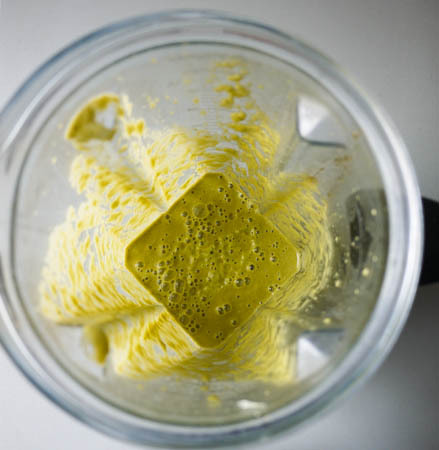 Blend until it’s all mixed into a smooth puree. Pour the mix over your chicken. 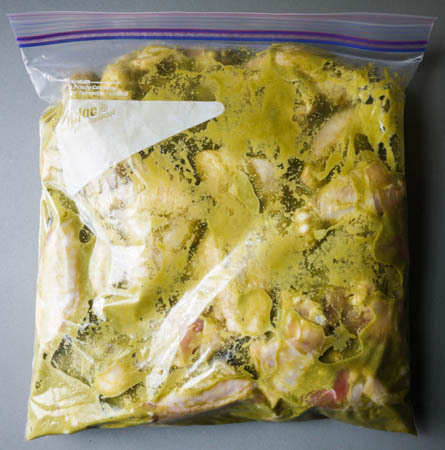 Close the bag, and squish the chicken around so each piece is coated with the marinade. Use this time to preheat your oven to 425 degrees. Line a baking sheet with foil. Remove the wings from the bag and place on a wire rack. If you don’t have a wire rack, put the wings right on the foil. They won’t be as crispy as if they were on a rack, but they will still taste delicious. Flip them over. 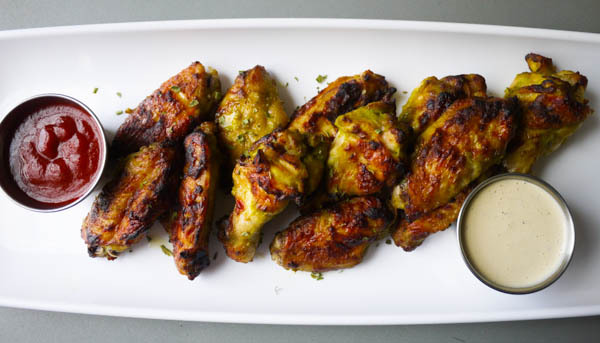 You can use any extra marinade to baste the wings once you’ve turned them over. Bake for another 30 minutes and serve. We like ours with sriracha and ranch dressing (pictured below). 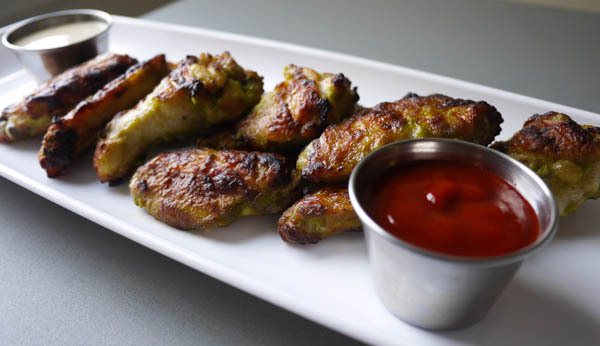 Chicken wings marinated in lime, cilantro, and spices and baked in the oven until crispy. Coarsely chop half an onion, de-seed 2 jalapeno peppers, pull out 3 cloves of garlic, zest and juice 2 limes, and break ½ a bunch of cilantro into smaller pieces. 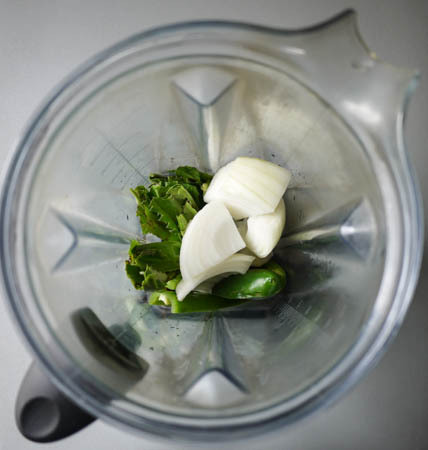 Blend until it's all mixed into a smooth puree. 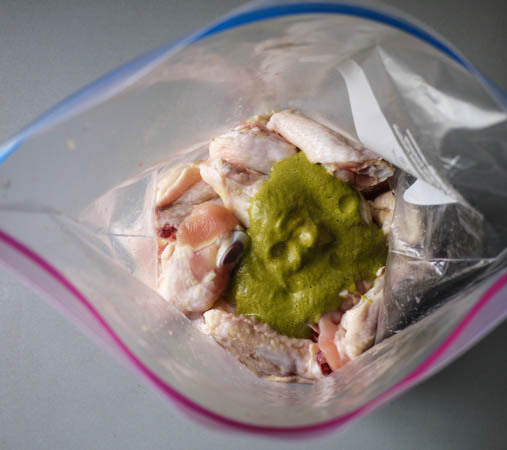 Pour the mix over your chicken, close the bag, and squish the chicken around so each piece is coated with the marinade. Line a baking sheet with foil. 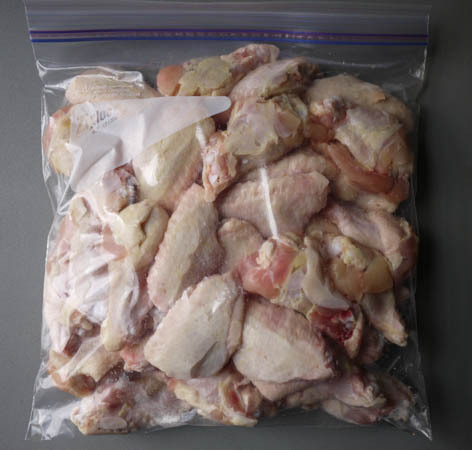 Remove the wings from the bag and place on a wire rack. 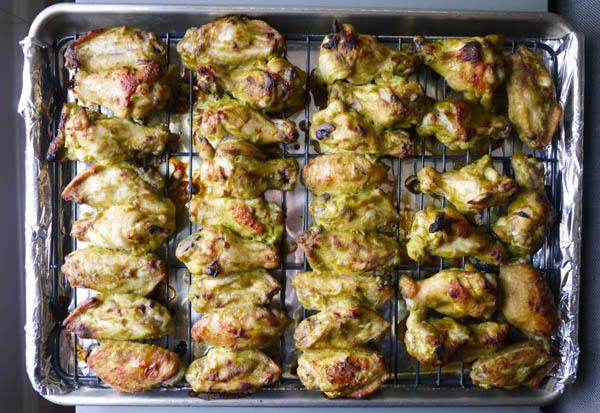 If you don't have a wire rack, put the wings right on the foil. They won't be as crispy as if they were on a rack, but they will still taste delicious. Flip them over. 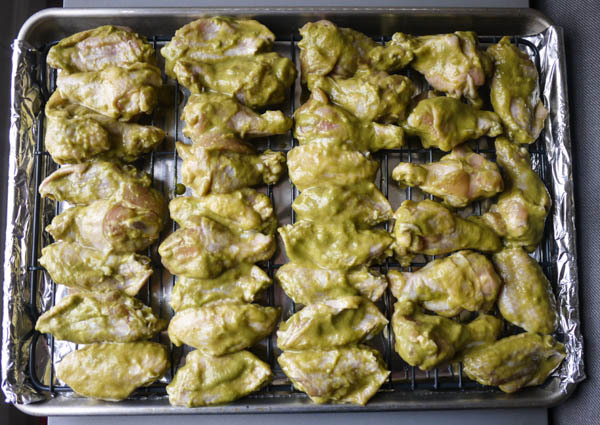 You can use any extra marinade to baste the wings once you've turned them over. Bake for another 30 minutes and serve. I love the presentation. It appears clean and appealing to the eyes. I also love the two sauces. Having the opportunity to try different sauces appeal to me. We will definitely try this recipe. Another fantastic work of art Tekesha! By the way, great story. We can easily visualize the moment and relate to the outcome. I really would like to try this recipe but I see it calls for “fish sauce”…my husband is allergic to seafood. Is there something else that I could use besides the “fish sauce” or is this sauce really important for this recipe?